Early on, Tizra made a very conscious decision to provide special support for PDF content, in large part because it's simple for publishers to create and work with. But nothing is ever so simple that it can't be improved with better understanding. Table of Contents headings in Tizra. Bookmarks in the PDF become your digital material's Table of Contents headings, which give your end users a quick way to reference exactly what's included in your online material, allows them to quickly link to each heading's content (if they're permitted to view the content, of course), and also provides a quick view of what sections -- if any -- are offered for free or download. 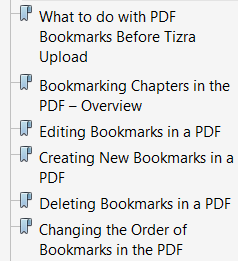 Tizra's new PDF Guide provides step-by-step instructions on how to create, edit, rearrange, test and delete Bookmarks in the PDF. other sections of the help documentation. Hyperlinks, which Tizra now provides enhanced support for, provide a great way to make your customers' reading experience even more interactive. You can create hyperlinks in your PDFs to take end users from the online content reader to other websites; to slide shows, videos, documents, etc. ; and even to other places within the same digital content, such as links from chapters to appendix activities, or to other cross references. Our PDF Guide walks you through creating hyperlinks to websites, digital files and other pages within the same PDF and also teaches you how to format the PDF text to look like a hyperlink, so that when your users are inside your online content, they'll know there's something extra to link to. Finally, we show you how to test those hyperlinks and make sure they're working properly. Logical Page numbers are another optional feature you can add to your PDFs. For some publishers, Logical Page numbers are unnecessary, and Tizra's digital page numbers work perfectly (page 1 is page 1, page 2 is page 2, ...,etc., no matter what the printed page reads). For other publishers, it is crucial that their digital page numbers match their printed page numbers. and even allow navigation to Roman numerals. customers to be able to navigate to the printed page numbers, including those printed with Roman numerals, would also be good candidates for setting up Logical Page numbering. Our new PDF Guide describes in detail how to set up Logical Page numbers in the PDF and how to test them in Tizra. These are just a few of the topics covered, so take a look! We hope you'll find the guide useful, whether or not you use Tizra to deliver your PDFs.